To say the 2012 playoff meltdown against the Philadelphia Flyers was the low point of Marc-Andre Fleury's career is cliche, but a dollar for every time it's been mentioned would have covered the contract that many viewed to be cumbersome and an albatross on a team many favored to win the Stanley Cup. To make matters worse, the shaky play continued the following postseason against the New York Islanders before Tomas Vokoun came in to steady the sinking ship. His teammates, to their credit, said all the right things to the media, lightening the load of the blame heaped on his shoulders, calling out the team's play as a whole. However, surely they had to privately, individually, harbor feelings that their goaltender had let them down. But a funny thing happened along the way while fans planned Fleury's exit from Pittsburgh. 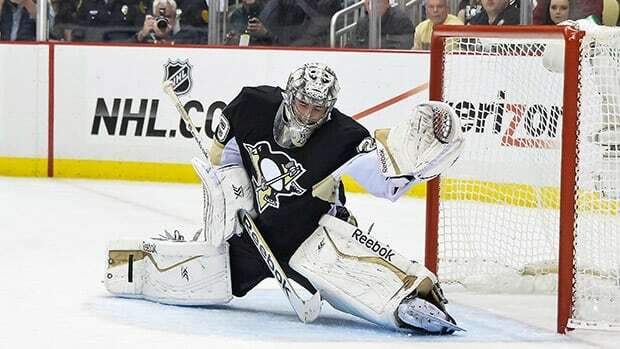 The 2014 playoffs kicked off, and Marc-Andre Fleury didn't implode as in postseasons past, but rather provided solid play as the team eventually squandered a 3-1 lead against the Rangers. Instead of being sent packing, he saw his contract extended, and he responded with easily his most consistent and arguably the best season of his career. Fleury was clearly responding to finally having a true goalie coach at the NHL level, and Mike Bales was capable of taking the raw athleticism that few can match between the pipes and considerably improved the technical aspects of his play. A quick five games ended the Penguins' Stanley Cup hopes in 2015, but unlike in years past, it was the skaters who couldn't live up to their goaltender as Fleury was more than capable of stealing the series for Pittsburgh while receiving little help from the offense. Despite the offseason additions that bolstered the forward depth to levels unseen by the current core group for many years, if at all in their careers, the play of the players in front of him has again placed the burden on Fleury's shoulders as it was against the Rangers. Except so far this season he's been able to take his game up another level. Through his first ten starts, Fleury has posted an impressive 1.71 GAA, 0.942 SV%, and already has two shutouts on the young season, pacing the league a year after leading the league with 10. He's been spectacular on high danger shots (0.883 SV%), on the penalty kill (0.918 SV%), and at even strength (0.949 SV%). Most importantly for a team that began the season 0-3, Fleury saved a season that threatened to unravel quickly in the early going and bury the team in a hole in the standings that would have proven to be extremely difficult to overcome. The forward group lauded during the offseason hasn't seen the results on the score sheet as the team is 25th in scoring with just 2.18 goals per game. A power play argued as one of Pittsburgh's most talented ever on paper has been mostly awful on ice, ranking 28th(!) in the league while converting just 11.4% of their man advantage opportunities despite the obvious star power at every spot on the ice. Most culpable has been a blue line with few legitimate top four options, one that has been a key factor in the team ranking 25th with a 46.8 CF% - a number that looks equally bad when accounting for score effects. Fleury has been the main reason, if not THE reason, that the team has been able to go 7-1 after that 0-3 start, and the reason why the Penguins currently sit 5th in the East instead of much, much lower. While he's not going to maintain his current level of play, his traditional stats the season so far would have led the entire league last year, after all; Fleury is threatening to put together an extremely successful season, and one that couldn't come at a better time. While it's hard to imagine the power play continues to struggle as it has given the caliber of player on the top unit, there doesn't appear to be any reason to believe the defense will suddenly flip a switch and be able to flip the ice in the possession game. Eventually the discrepancy in shot attempts will catch up to Pittsburgh, and whether they need to make a trade to reinforce the defensemen, or just optimize the current lineup that they have, the team needs to do something to save Fleury from having to be their saving grace.